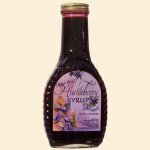 This exotic Wild Huckleberry Syrup will turn any breakfast into a memorable event. Great for pancakes & crepes! Ingredients: Wild Huckleberry Juice, Sugar, Corn, Starch, Citric Acid.